GPS Points N65° 8' 16.589" W21° 44' 0.189"
According to Laxdaela saga, Gudrun Osvifursdóttir used to dwell by a geothermal pool in Laugar in Saelingsdalur. The pool is mentioned in Sturlunga saga and it seems to have been used a great deal. Vogur Country Lodge is a pleasant guesthouse that is uniquely located in the beautifully located Breiðarfjörður Bay. Gudrun Osvifursdottir, heroine of Laxdaela Saga, was born (973AD) and brought up at Laugar. It is said that she used the hot water pool there a lot and also met there her followers Kjartan and Bolli. There is a geothermal area at Laugar and a naturally-heated swimming pool was built there in 1932. The hot water is also used for heating up the buildings at the place. There is a summer hotel and a folk museum which opened in 1977. At about 3 km from Laugar you may find the rocky hill Tungustapi, home of elves. 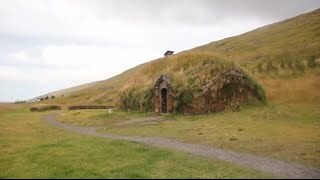 Around the year 890, Audur the Deep minded (djúpúdga) from Dogurdara settled the land between the outer edge og Hvammsveit and Skaumuhlaupsa in Hordudalur. She built her farm at Hvammur and for a long time after her kin lived there. Audur was Christian. The father of Snorri Sturluson, Sturla Thordarson (1115-1183), lived at Hvammur. He was of the ninth generation counting from Audur the Deep minded. His sons Thordur, Sighvatur and Snorri were born there. Arni Magnusson (1663-1730), professor and collector of medieval manuscripts, grew up at Hvammur. Priests would remain at Hvammur. Since the Reformation until 1944 only 15 priests held the position. The pool is believed to have been destroyed in a landslide. In 2009 a new pool was built near to the location where the old pool is thought to have been situated and named Gudrunarlaug. A changing facility, referred to as a "house of modesty" in Icelandic, was also built at the same time. From the mountan Klofningur is a panoramic view over Breidafjordur Bay, Snaefellsnes Peninsula and Bardaströnd. Viewing dial. It is possible to hike up the mountain from the farm Stakkaberg. Skard is a farm and church site on Skardstrond. Many of the Icelandic Saga heroes come from here. Amongst them were Bjorn Thorleifsson, governor, and his wife, Olof-the-Rich Loftsdottir. On the death of her husband by Englishmen in 1467, she is quoted as declaring: "shed no tears for farmer Björn, but gather men to avenge him..." This has become a famous quote in Iceland. The Skard church was the main church of the area for a long time. The church was rebuild between 1914-1916 and there are many old relics to be found in it, among them a preacher´s stool from the 17th century. Takes its name "Breakfast Ness" from the fact that Auður the Deep-minded, one of the first settlers, stopped to rest there one morning while searching for a place to make her home. There is a little church at Dagverdarnes dates from 1934. Auður djúpúðga ( Auður the Deep minded) was one of the settlers in Dalir. She was a Christian and had a cross raised at Krosshólaborg, where she went to pray. Her descentants considered Krosshólaborg a holy place. Women in Dalir set up a memorial of Auður, a stone cross in 1965. The remains of Auður´s first farm, Auðartóftir, are nearby.